My name is Joseph Diddo. I work in language culture. 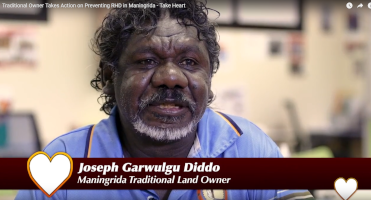 I am a traditional land owner in Maningrida. And support the children to learn about the things like we do. Back in day one, the old people didn't know we going to see the witch doctor like Guragone and try to get their help with the bush medicine but couldn't help. They came to the language and culture to support and the understanding what the rheumatic heart thing comes up and then there's, so we link together in language, in English, to understand together. So community can know about these things happening, rheumatic heart disease. They hear the local languages, and different languages. They quite understanding what this is. You have to do the right thing. And wash your hands. Don't share with anything else. And then they share to the parents and the parents can share in different languages all that.